I just love the summer, because of the good weather, ice cream, dresses,… But summer also means that you show off some more skin, certainly on the beach or at the pool. But we all know the problem named… unwanted hairs. Some people are lucky and don’t have much unwanted hairs or blond/light hairs. But the most people aren’t that lucky and we have a lot of unwanted and dark hairs. So yes, you have a lot of different hair removal methods. The most comment method is shaving. But to do this every day in the summer is a lot of work. And also painfull, think about the shaving wounds. I’m not a huge fan from shaving, I prefer a method that gives a longer effect, waxing! I’m a huge fan of waxing! I know that some people find this very painful. 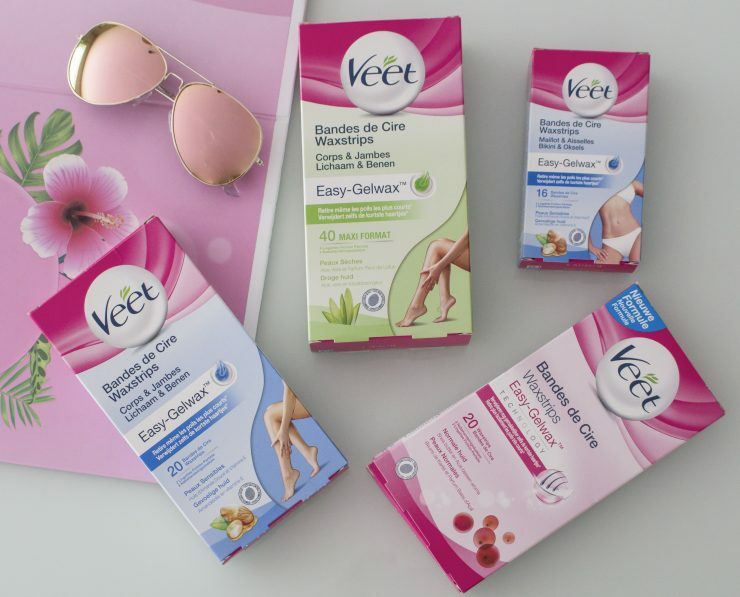 But in this article I will not only review these wax strips from veet, but I will also give you some good tips for an almost pain free wax session! In the past I already used the wax strips from veet, but now they have a new formula and this turned out amazing! First of all the strips all have a lovely smell, for sure the one for a dry skin! What is different with these strips is that these also must remove the shorter hairs and that you don’t have to rub the strips any longer to each other to warm them up. So this only makes the waxing process quicker and easier. All the variants of the wax strips indeed remove also the shorter hairs! These wax strips are so easy to use. Also with these you don’t have the problem that a lot of the wax will stay on your skin. And if this is the case that you can easy remove it with the sheets that you get with these waxing strips. The first time waxing can be painful, but when you do this more often the hairs will come back less and less so it will be less painful. The wax strips from veet are so use friendly! I only can recommend these strips, because they are so easy to use! And with waxing your hairs will stay away longer, this depends from person till person but with waxing the hairs mostly will be away for 2 till 4 weeks. Or if you are lucky even longer! 😉 To wax my both under legs I needed 6 strips, and 1 strips is 2 lose once so I used 12 lose once. And it took me around 15 minutes to do both legs. 1. You pull the strips of eachother, en then you bring 1 strip onto your skin. 2. Rub good over the strip in the growth direction from the hair, this way the wax will stick. You can better rub a time too much the too few. 3. Then with one hand you pull the skin tight and with the other you make a quick and parallel to the skin movement to pull it of the skin. Never pull away the strip from the skin, but pull it as parallel to the skin as you can. 4. If some wax sticks to the skin you can always lay the strips once again on that part, rub well and pull it of. Then the most of the wax must be gone, the last sticky parts you can always remove with the treatment wipes. – Scrubbing, scrubbing and more scrubbing. It’s imported that 2 days before you wanna wax your legs or… that you scrub this zone well to remove the death skin cells. – A trick from in the beauty salon… If your are sweating or it’s your first time or it hurt just too much or… Then you best can put a tiny layer of talk power on it, just a tiny layer is good enough. And thanks to the talk powder the wax will less stick on the skin an more on the hairs. – Do you have too much pain? Then you can cool the skin before waxing with a cool pack. – You don’t have to throw away a wax strip after 1 time using, because you can use these veet strips multiple times. – Is it to hard to remove all the residual wax with the treatment wipes? Then is a good oil your best friend. – Don’t directly go in a bath, sauna or in the sun after waxing. Because after waxing is the skin extra sensitive and it needs time to recover. If you are looking for amazing waxstrips that do what they must do and even remove the shorter hairs… Then are these veet waxstrips what you need! You can find this in the drugstore. And another little tip… Veet also has special small waxstrip especially for your armpits and bikini line, also very handy! Veel positiefs hier over gelezen! Ik heb zelf gebruik gemaakt van IPL dus hoef echt 1x per halfjaar te scheren! vind ik altijd het best resultaat geven. Klopt geeft inderdaad een goed en lang resultaat! En dat is inderdaad een goede aanvulling op mijn tips! Slimme tip van de talkpoeder, die kende ik nog niet! Vroeger gebruikte ik ook wel waxstrips maar er bleef altijd wax op mijn benen zitten. Daarom gebruik ik nu altijd een epilady. Vroeger vind ik dit helemaal niks. Er bleef altijd wax op mijn huid achter en haar haha. Als het vernieuwd is ben ik er wel weer benieued naar.